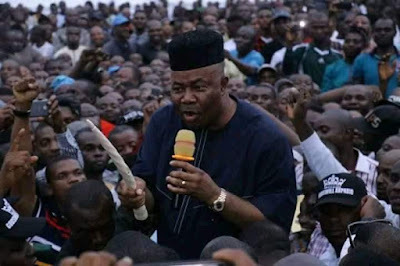 Following contradictory reports and allegations of false statements in the media, Senator Godswill Akpabio prevented Sunday journalists from accessing his home at the UKana Ikot Ntuen Essien Udim LGA. Akpabio was charged to meet with candidates looking for offices as part of the Progressive Congress platform. About 6 journalists were not allowed to enter the premises as security officers insisted that they were not on the guest list. Previously, journalists had free access to the premises, especially after the defection of the senator of the PDP at APC. An internal source revealed that the former leader of the senatorial minority was dissatisfied with the information disseminated by the media and the crises it could trigger. The PUNCH newspaper recently reported that Senator Akpabio "regretted imposing Udom Emmanuel as governor of Akwa Ibom State. He added that all hands must be on the bridge for the error to be corrected. "Udom (Emmanuel) is an error that needs to be corrected in 2019. All hands must be on the bridge to make sure the mistake is corrected for a people-oriented leadership under Progressive Congress at the center. "I want to thank you for having challenged the rain to honor me as your leader and go out in this multitude, even at very short notice, which shows the level of love and trust you have in me as a leader. that leader and I promise to reward you for your time and energy in this very important project, "he said. Senator Akpabio, through his media assistant, denied making such statements. "We categorically assert that such an affirmation never came from Senator Akpabio. Senator Akpabio knows that the power comes from God and therefore can not say that it was a mistake for God to make the governor of the deacon Udom Emmanuel in 2015 ".